It has sometimes been claimed that many of those who support what are conventionally known as the Far Right and the Far Left are remarkably similar to one another, at least psychologically: dogmatic, narrow-minded, inflexible, opinionated, dreadfully earnest and, in many but not in all cases, lacking a healthy sense of humour. Some of the key words used by people on the Far Right and the Far Left are different, but the all-important style can be remarkably similar. If this is the case, then President Putin has changed only slightly since he stopped being an ardent communist secret policeman and quickly, once the USSR imploded, became an active wheeler- dealer and strong supporter of primitive, obscurantist, pre-modern, rather than contemporary, tolerant and humanistic values – all this without showing any signs of guilt, embarrassment or repentance for his murky activities in the past. Those who organised and ran the GULag, the terror and the purges should, he now says, be forgiven, but should this generosity also apply to the Nazis as well? Ukraine is currently accused of promoting fascism, yet the Russian authorities are themselves happily collaborating with extreme right-wingers when this appears to be a way of weakening the West and strengthening the messianic and neo-Eurasian imperialistic aspirations of the regime centred on the Kremlin and Old Square (the HQ of the Presidential Administration). Many people, not least some of those surprised by the result of the referendum on Brexit and the election of President Trump, have the feeling that a ‘paradigm shift’ is taking place, for better or for worse, in political developments around the world. Is it stoppable and reversible? Are ‘Western values’ under serious threat from what some observers consider to be outdated and harmful rather than traditional and acceptable attitudes and opinions? With Putin, health permitting, likely to be the President of the Russian Federation for another six years, this is just the time to read Shekhovtsov’s pioneering monograph and decide whether or not he is exaggerating the likelihood that the Far Right could have a lasting and decisive impact on the future of the West. For most readers, the names of the majority of the numerous European and American Far Right activists about whom he writes will be unknown. Our very own Nigel Farage is absent from the Index, but one can assume that for most of the present-day Far Right activists named in the book he is a genuine hero on whom they should model themselves. The Introduction takes us back to the inter-war years when the Italian Fascists conceived the nation in ethnic terms, whereas the German National Socialists were articulating their idea of the nation in racial terms (p. xxii, italics added). A distinction is made between radical right-wing movements and extreme right-wing movements: the former reject violence, the latter ‘tolerate or even embrace it’ (p. xxiv). Distinctions are also made between present-day European Far Right parties: they may be ‘committed’, ‘open’ or ‘hostile’ to the Putin regime (p. xxvi). Chapter 1 Discusses the links between Germany and the USSR in the 1920s and 1930s — not surprising, one might add, as both Hitler and Stalin were socialists, and by the mid-1930s the latter had become much more of an honorary Russian nationalist. Chapter 2 discusses the role in the 1980s and 1990s of Russian nationalists such as Aleksandr Dugin, Vladimir Zhirinovsky and Sergey Glazyev, building — I also add — on the foundations of Soviet Russian nationalists associated with, i.a., the journal Nash sovremennik (Our Contemporary). They are opposed to ‘American-style liberalism, globalisation and the “New World Order”’ (p. 43). The desire for both ‘national justice’ and ‘social justice’ makes cooperation with some Far Left movements possible. Chapter 3, on contemporary Russia as an ‘authoritarian kleptocracy with a twist’, gets to grips with the fundamental pillars of the regime fronted by Putin. Shekhovtsov is convinced that its ‘ultimate aim is not the revival of Russia, restoration of the Russian empire, or the well-being of the Russian nation, but rather the preservation of the existing patrimonial regime at any cost’ (p. 71). ‘The Kremlin’s violent crackdown on the political opposition at home and [its] aggressive foreign policy’ are the result of ‘Moscow’s increasing inability to secure socio-economically based legitimacy and preserve the regime by any other means, either through soft power, diplomacy or even soft coercion’ (p.71). Hence, reinstating control over the major mass media ‘was the cornerstone of Putin’s rise to authoritarian power’ (p. 72). His regime has ‘globalised its self-preservation drive’ by ‘assuming the role of a leader of the international movement struggling for a multipolar world, but intrinsically — against the United States’ (p. 81). Chapter 4 is about the utilisation of unscrupulous far-right election observers to claim that the results of elections deemed not free and fair by the relevant established Western organisations are, in fact, completely valid. Pro-Putin left-wing ‘political forces that support the allegedly anti-globalist (in effect, anti-American) agenda of the Kremlin’ sometimes help out the radical right-wing movements and parties (p. 124). Chapter 5 sheds light on some adherents of the Far Right, ‘fringe activists’ and others who are happy to contribute to the Russian mass media’s attempts to persuade more foreigners to ‘question more’, trust propaganda, not journalistic, outlets like RT and Sputnik, and cast doubt on the veracity, reliability and objectivity of most of the news outlets of their own countries. How successful this application of soft (but not very smart) power may prove to be is the subject of much debate in Scotland, as elsewhere. The author concludes that these media are now aiming ‘not so much at justifying the Kremlin’s domestic and foreign policies, but rather at undermining the confidence of international audiences in the legitimacy of their own governments and, in more general terms, of the liberal-democratic consensus’ (p. 154). Chapter 6 discusses a variety of Far- Right organisations working in Europe, especially those in Austria (where a party of this nature became a member of the governing coalition on the day this review was being written), Italy and France, and including a number of official Moscow-based institutions. Rossotrudnichestvo, for instance, targets people from the former USSR who reside abroad as well as any and all others, whereas Russky Mir focuses mainly on foreigners and aims ”’to promote values that challenge Western traditions”, especially in the countries that were Soviet republics before 1991′ (p. 178). Chapter 7 provides information on present and former members of the European Parliament and other institutions who are or were acting as ‘wreckers’ by trying to disrupt them from within — and not without some success, as is now clear. Many, but not all, of these people seem to resemble Western pro -Soviet fellow-travellers in the 1930s and later, with no knowledge of Russian and very little interest in what was actually going on inside Russia, but doing what they could to contribute to the ongoing ‘Decline of the West’ – perhaps, in some cases, even without realising it. 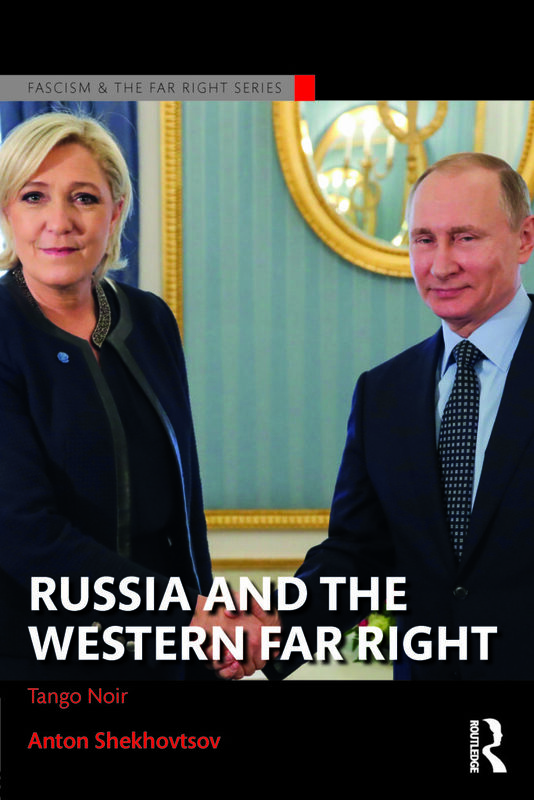 The Conclusion states that today certain ‘far-right forces in Europe, North America and elsewhere embrace Putin’s Russia as an ally in their struggle against Western liberal democracy and multiculturalism hoping that a (geo)political alliance with Moscow will help them reconstruct the mythologised and romanticised nation -state and “take our country back”’ (p. 247). Perhaps addressing those who think that this book is far too alarmist, its author reminds us that ‘Russian Neo-Eurasianists had developed relations with, and trained, pro-Russian separatists in Eastern Ukraine [for] almost 10 years before the latter facilitated the Russian invasion of the region in 2014’ (p. 253). Well, we can’t say we haven’t been warned! I have, however, to add one warning of my own to prospective readers who are unduly sensitive to the (mis)use of English, which is not Shekhovtsov’s mother-tongue: for some reason his text has not been professionally style-edited, and although the meaning is always clear, some people will find it painful to read. I have made scores of suggestions in my review copy, in the hope that there will be a second, amended and, perhaps, expanded edition of this very valuable and timely monograph. First published in the Scotland-Russia Forum magazine, No. 38 (Winter 2018), pp. 10-11.